World-record breaking auction house Julien’s Auctions will pay tribute to one of the most influential heavy metal heroes and forefathers of the head-banging music genre with Property From The Estate Of Ronnie James Dio, taking place Friday, September 14 and Saturday, September 15 live at Hard Rock Cafe in New York and online at www.juliensauctions.com. Now is your chance to own a part of heavy metal history! 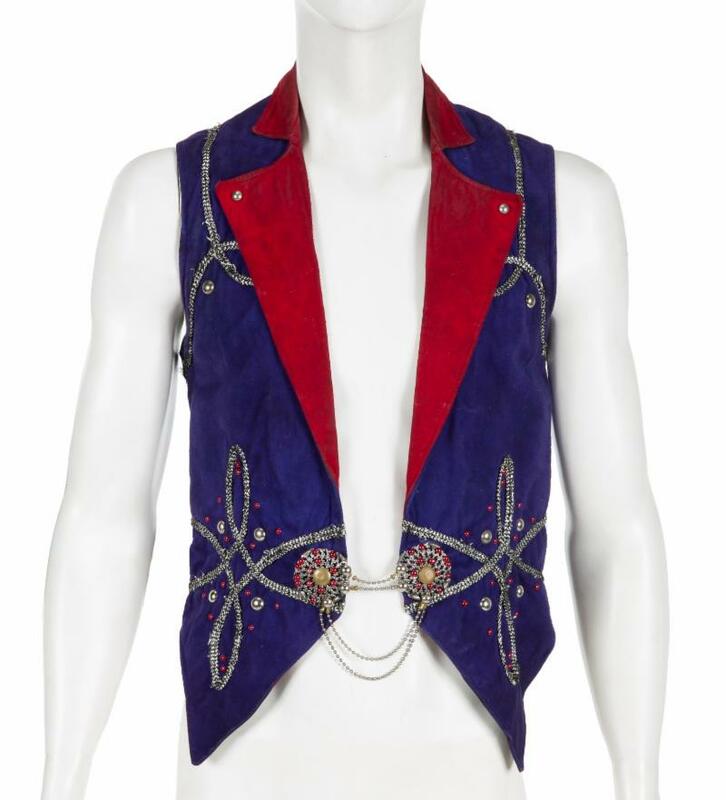 Highlights of the auction include several pieces of original album artwork including the acrylic painting by Barry Jackson used as the cover for the 1984 Dio album The Last in Line (estimate $20,000-$30,000); his pair of moon and stars patchwork jeans worn extensively on stage with Rainbow (estimate $2,000-$4,000); Dio‘s custom made violet suede vest with tails and red leather shin guards worn on stage and in promotional photographs for the 1985 Sacred Heart Tour (estimate $2,000-$4,000); a personalized Black Sabbath hooded velour robe from the 1981 Mob Rules tour worn regularly back stage (estimate $1,000-$2,000); Dio‘s personal rolling wardrobe case (estimate $800-$1,200); some of the most ambitious and spectacular stage design rock has ever seen with props such as a monumental animatronic sphinx on plinth base from the 1984 The Last In Line tour (estimate $2,000-4,000) and a massive animatronic dragon’s head from the 1985 Sacred Heart tour (estimate $3,000-5,000); an array of Dio‘s studio and stage used instruments and gear such as a custom Charvel guitar featuring a one-of-a-kind wizard paint motif (estimate $3,000-$5,000); a 1978 “Gold” record award commemorating Australian sales of the Rainbow album Rising (estimate $600-$800) and a 1978 “Gold” record award for the album Rainbow: On Stage (estimate $600-$800) and more. Enter Absentee bids. Absentee bid forms are included in the back of each catalog and are also available by calling Julien’s Auctions or online at www.juliensauctions.com.